Muskox or Muskoxen are a prehistoric looking animal that thrives in the cold climate of Alaska's high Arctic slopes. They can survive these severe conditions in part due to their dense undercoat of woolly fur called qiviut, which is said to have an insulation factor 10 times that of wool. They have changed little since the ice age. next » | 195 sample images from this category. Try a keyword search to see them all. Muskox in the snow along Alaska's Arctic north slope. 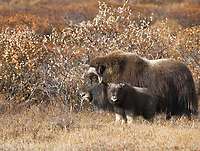 A young muskox calf and adult on the tundra of Alaska's arctic north slope. Muskox on the autumn tundra, Brooks Range mountains, Arctic, Alaska. Muskox on the autumn tundra on Alaska's Arctic North Slope. Bull Muskox, Arctic Coastal Plains, Arctic, Alaska. Muskox stands on the snowy tundra of Alaska's arctic north slope. Bull muskox on the snowy tundra of Alaska's Arctic Coastal Plain. 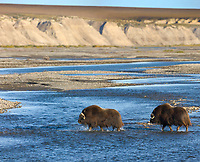 Three muskox on the tundra, Seward Peninsula, arctic Alaska. Male muskox in Atigun Canyon, Brooks Range, Alaska. Muskox on the autumn tundra, Arctic, Alaska. Muskox cross the James Dalton Highway, Brooks Range, Arctic, Alaska. Muskox in the snow tundra of Alaska's Arctic North Slope.